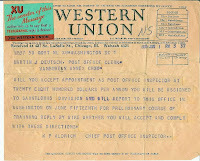 From 1851-2006 Western Union became almost synonymous with telegrams. (In 2006 they ceased providing their telegram service). I have several telegrams in my document collection, most of which were received by my grandmother Myrtle (Van Every) Deutsch. Together, they illustrate various reasons people sent them. Since by their nature most of them are short, I thought I would combine several of them together. [Minnie was my grandmother's sister, and Josie her step-mother. Her father's death certificate says time of death was six oclock. I was surprised not to find more telegrams in my family collection. They tended to use postcards instead. At least on my mother's side. My father was a telegrapher for awhile and I know they used telegrams quite often, they just didn't save them.